Please excuse our mess. The digester is still under construction! The planned anaerobic digester is a key feature at The Plant, as it is designed to solve several critical issues by reusing what is conventionally considered “waste" while creating several valuable outputs. 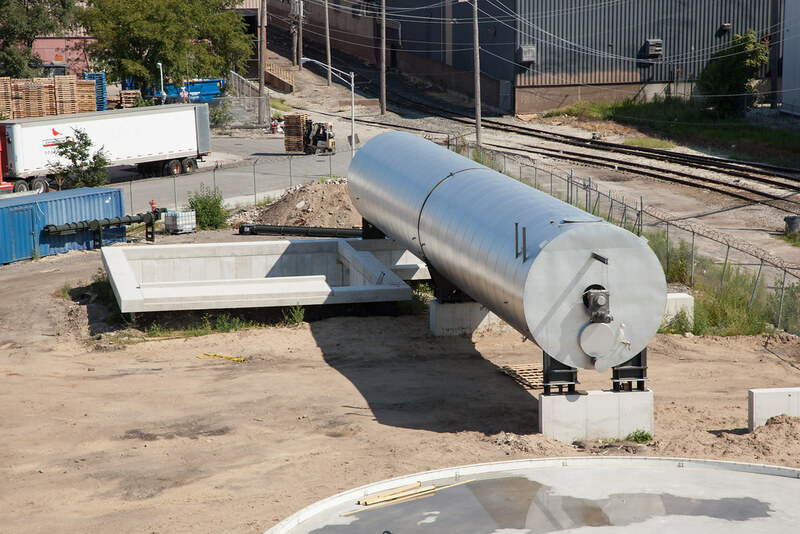 This anaerobic digester is unique in that we are neither a waste hauler nor the source of the waste processed; instead, we envision the digester project as an opportunity to provide food-waste processing alternatives to businesses in the surrounding urban industrial area as well as elsewhere in the City, while also realizing the revenue possible by harnessing this valuable waste stream. Waste from the building will be a fraction of the volume of waste processed by the digester, yet the digester will demonstrate that even food‐production businesses, which are typically waste and energy intensive, can operate sustainably by closing waste loops. This project has been on hold due to a financing gap, but Bubbly continues to pursue alternate financing sources and partnerships; we made progress on required sitework in 2018 and are aiming to recommence installation of equipment in 2019. The digester is completely planned, engineered, and shovel-ready, pending the confirmation of sources to close the funding gap. Bubbly Dynamics has already secured all necessary permits, with remaining operating permits to be obtained after installation is complete and the digester is ready for operation.